Motorola has launched its new device called Motorola Xoom. 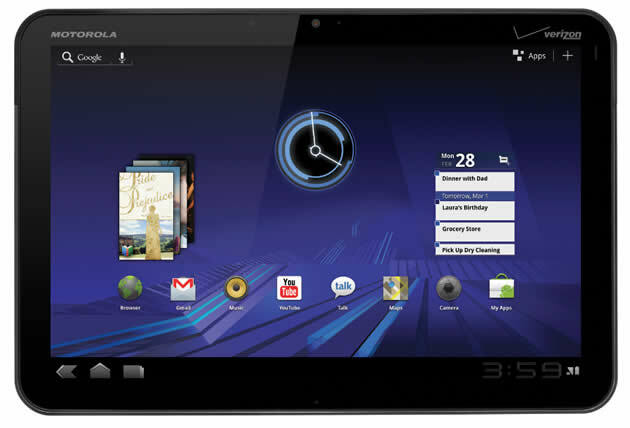 The new Motorola Xoom tablet has been one of the most anticipated tablets to hit the market. It has a true tablet OS, handsome looks, and features that seem to fit the bill of a killer tablet. But for a tablet to truly be an iconic device, features, looks and OS must work in perfect harmony to deliver an experience that is flawless. The device comes in at 9.8 inches wide, 6.6 inches tall and a half inch think. It has a solid amount of mass to it, but isn't so heavy that you will get tired of holding it upright while watching a movie or recording one. It sports a resolution of 1200x800, Nvidia Tegara 2 graphics, 3G, 4G, 802.11n, personal hotspot, 10.1in display, two cameras, 32 GB onboard storage, SD card slot support and 1GB of DDR 2 RAM. The proverbial dream tablet, if you will. But it's not all about the hardware, even the best hardware can be gimped by faulty software. This bad boy runs Google's Honeycomb 3.0 software and it definitely shows that this is an early software release. More on that later. Having said all of the above, is this a good tablet? Yes, if you don't want to buy into the Apple cult, this is your tablet. But, you need to understand that the OS is not perfect and if you can wait for a revision of the OS, your experience will be that much better. Motorola hit a homerun with the hardware and build quality but we need the OS to catch up to it. The Xoom is a top notch product, and you will be happy with it as long as you know that you need Google to update its OS to make it a flawless experience.